The first tech company that DIF has invested is CloudFactory Group in April, 2017. The first tech company that DIF has invested is CloudFactory Group in April, 2017. CloudFactory was founded 2010 with a bold vision to disrupt the traditional BPO industry with innovative technology and an Impact Sourcing model focused on connecting people in the developing world to meaningful work and equipping them with the skills they need to contribute to the global economy. CloudFactory uses the power of the cloud to connect their talented workforce, based mainly in Nepal, to some of the most innovative companies around the world, helping them offload routine, but critically important digital work so they can focus on innovation and growth. This includes tasks such as transcribing receipts for expenses or annotating thousands of images for companies developing the algorithms that will drive the next generation of technology like self-driving cars and virtual reality. 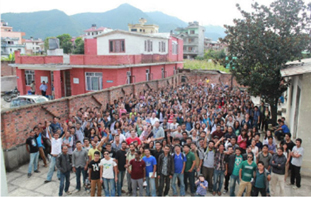 CloudFactory has provided employment for over 1,500 people in Nepal and the investment from DIF aims to enable them to create meaningful work for thousands more.